A Brown University study provides new evidence that the icy shell of Jupiter's moon Europa may have plate tectonics similar to those on Earth. The presence of plate tectonic activity could have important implications for the possibility of life in the ocean thought to exist beneath the moon's surface. The study, published in Journal of Geophysical Research: Planets, uses computer modeling to show that subduction—when a tectonic plate slides underneath another and sinks deep into a planet's interior—is physically possible in Europa's ice shell. 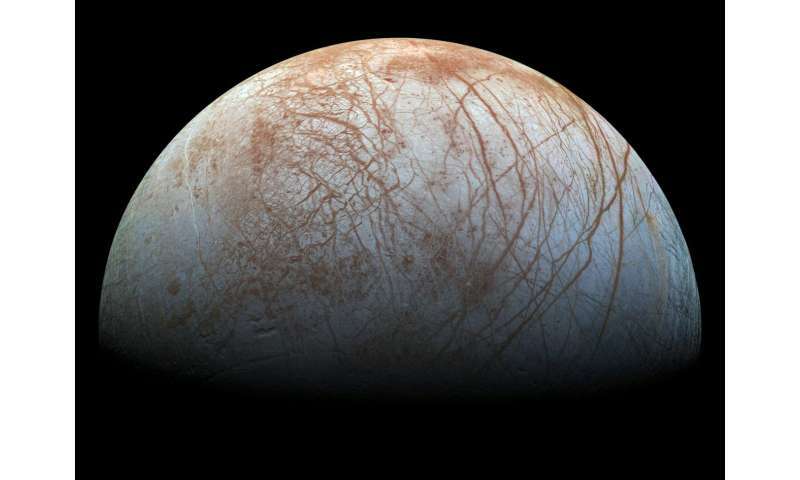 The findings bolster earlier studies of Europa's surface geology that found regions where the moon's ice shell looks to be expanding in a way that's similar to the mid-ocean spreading ridges on Earth. The possibility of subduction adds another piece to the tectonic puzzle. And there's good reason to suspect that variations in salt content do exist on Europa. There's geological evidence for occasional water upwelling from Europa's subsurface ocean—a process similar to the upwelling of magma from Earth's mantle. That upwelling would leave high salt content in the crust under which it rises. There's also a possibility of cryovolcanism, where salty ocean contents actually spray out onto the surface. Johnson's co-authors on the paper—Rachel Sheppard, Alyssa Pascuzzo, Elizabeth Fisher and Sean Wiggins—are all graduate students at Brown. They took a class Johnson offered called Ocean Worlds, which focused on bodies like Europa that are thought to have oceans beneath icy shells.